“Besides working well on psychological traumas, EFT has established a track record of effectiveness in shifting, or even curing physical ailments.” – Dawson Church, Ph.D.
EFT or Emotional Freedom Technique is, as its name suggests, a simple means of freeing oneself from emotions and traumas stored within the body. This practice believes that by tapping on a few specific points on the side of the hand, head/face, and torso, one can relieve energy blockages and access the body’s natural healing capacity. EFT, which is also referred to as “tapping,” was first developed by Gary Craig in the mid-1990s, and has been popularized and utilized by a variety of energy psychologists and healers including Dawson Church, Ph.D., David Feinstein, Ph.D., Cheryl Richardson, Donna Eden and many more. In fact, it is one of the most popular therapeutic tools used in Energy Psychology. Since the ultimate goal of EFT is to release energetic and emotional blockages by stimulating points on the body, it is similar in philosophy to acupuncture in Traditional Chinese Medicine, and manipulation of the marma points in Ayurveda. Editor’s Note: There are several variations to the steps for performing EFT. The following is a simple 4-step approach based on what has worked for me. Please note, there is really no wrong way to do this, and part of what helps it to work is to surrender fully to the process. Assess your feelings – Ask yourself what you are feeling and where you are feeling it, and rate that feeling on a scale from 1 to 10 (i.e. “I am so fearful I would rate it at a 9, which I feel as tension in my stomach.”) This step will help you in addressing your issues and in determining if you are getting any relief once a tapping cycle has been completed. If you are overwhelmed with emotion, and feel incapable of accurately assessing your feelings, you can move directly into tapping until you regain your composure. Recite an affirmation – To begin the releasing process, make an acknowledgement statement “even though I have _____”(the problem or emotion you are feeling), and follow with an affirmation statement, “I fully and completely accept myself. *” As you do this, tap on the underside of your right hand with your left fingers (just below the base of your pinkie finger) *Some suggest that it helps to state the acknowledgement in the past tense and the affirmation in the present tense. Tap– Continue tapping rhythmically (5 -7 times) on a series of points using the fingertips of your left hand. As you tap each point, you can repeat a word that reminds you of the problem (i.e. fear, anger, anxiety). The series of points includes: between the eyebrows, side of the eye, under the eye, under the nose, the chin, the collarbone, under the arm (in the arm pit), and on the top of the head. (See photo above). For the last three points you can use the palm of your open hand. End with a deep breath. Reassess – After completing a cycle of tapping reassess how you are feeling on that 1 to 10 scale. The number should decrease to a more comfortable level. Continue tapping until you are feeling at ease, or as close to 0 as possible. Reduction of physical symptoms such as pain, headaches, allergies, digestive problems, allergies, etc. EFT Tutorial Video – www.youtube.com/watch?v=4ZDjAhuo_6Y – explained in detail and demonstrated by Dawson Church Ph.D.
EFT: Emotional Freedom Techniques® – www.soulmedicine.net/eft.html – a series of 5 videos on EFT demonstrated by Gary Craig. Additional EFT information and resources can be found on the Energy Psychology page. EFTUniverse – http://eftuniverse.com/ – a site with a variety of tutorials and resources from the leaders in EFT research. Gary’s Official EFT™ Tutorial – www.garythink.com/eft/ – details on how to perform tapping (EFT) from founder Gary Craig. 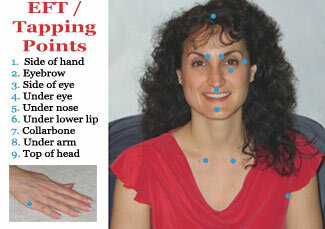 TapIntoEFT.com – www.tapintoeft.com – includes an excellent article on the specific EFT Tapping Points and what they are used for. The Tapping Solution – www.thetappingsolution.com – the site offers a free e-book with easy steps and a helpful diagram of the tapping points.